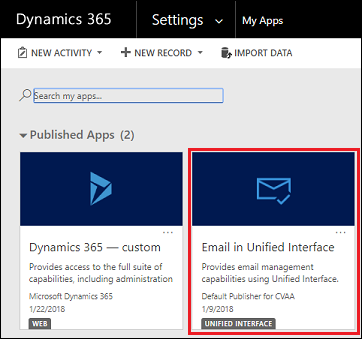 To improve accessibility when reading and editing email in Dynamics 365 for Customer Engagement apps, we're introducing an app that provides an accessible email flow. This topic explains how admins can enable this flow and how end users can access it. Follow these steps to deploy the solution and enable users to use the accessible flow. Browse to the Microsoft 365 admin center and sign in using Office 365 Global administrator credentials. You can also sign in with Customer Engagement apps system administrator or delegated admin security roles. 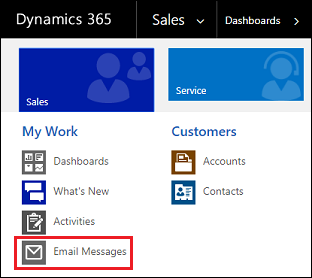 Select Admin centers > Dynamics 365. Select the Instances tab, select the instance to add the app to, and then select Manage your solutions . Select the Email in Unified Interface app, and then select Install. You can now see the app in the list of published apps. Go to Settings > My Apps to see it. For users who want to have accessible email access, follow these steps. In the list, select the user or users that you want to assign a security role to. Only the security roles available for a user's business unit are displayed. In the Manage User Roles dialog box, select the Email app access role security role, and then select OK.
Once the app is installed, notify users that they need to reload the web application to see and use the accessible email flow. Users with the Email app access role, go to Sales, Service, or Marketing. Select Email Messages to open emails. If you don't see Sales, Service, or Marketing, your Customer Engagement apps has been customized. Talk to your administrator or customizer. Email Messages will not appear if Activities has been customized to not be included in the sitemap. Here, you can read and manage your emails in the Email in Unified Interface app.